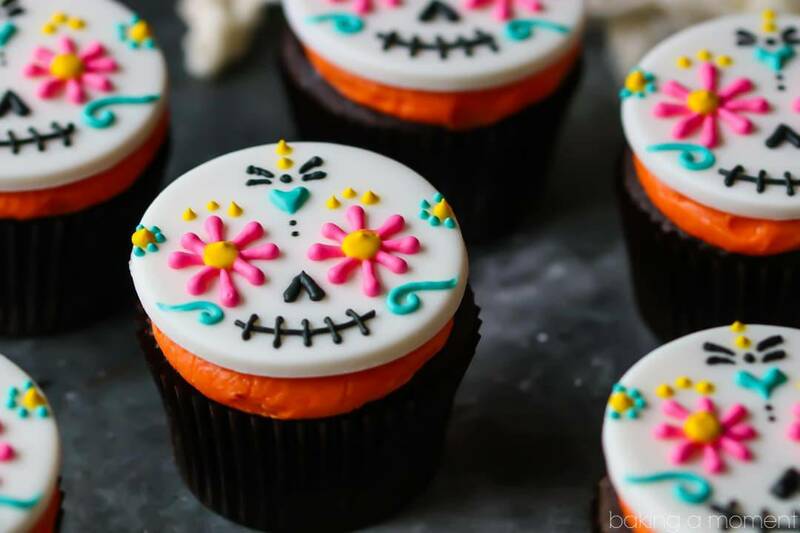 Make these colorful Day of the Dead Cupcakes this Halloween! They’re so much fun and so eye-catching. Sure to be the talk of the party! Hey I hope you had a fantastic weekend! We are officially DONE with fall baseball, and basketball doesn’t start for a few more weeks. It was pure bliss to be able to do whatever we wanted to do! For the kids and husband, that means a variety of outdoor activities, alternated with plenty of video-game-playing and YouTube-video-watching. But for me, it was a rare opportunity do dive into something fun and artistic. 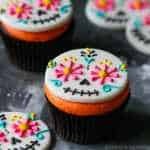 I’ve had day of the dead cupcakes on my mind for some time. I just love the bright colors and floral patterns that you always see in all the dia de los muertos imagery. Isn’t it beautiful? I love it because it’s festive and fun, but still a little spooky at the same time. I’ll take pretty flowers over blood & guts any day! I started out by just sketching around on paper to see what would look best. I even played around with colored pencils a bit! When I do this kind of decorating, I try to be mindful of not having to mix too many different colors. So this design uses just 3 colors plus black. 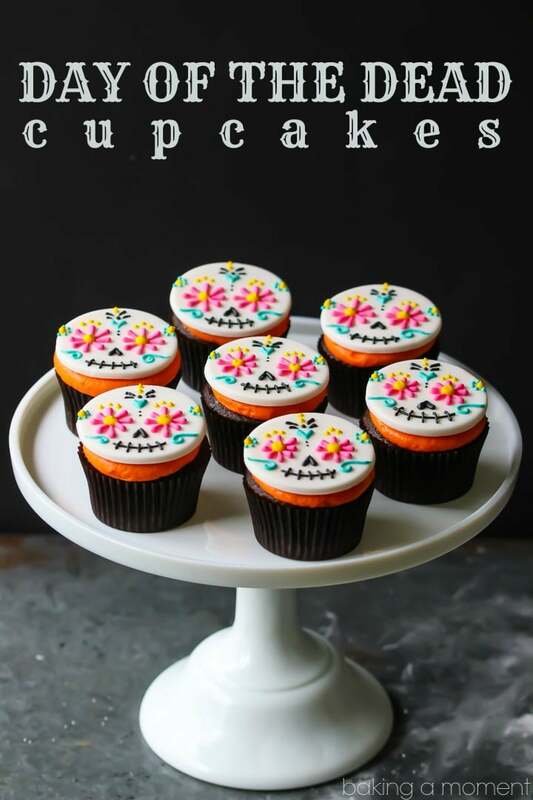 I had some leftover frosting laying around so I just tinted it orange to make these day of the dead cupcakes even more colorful. Let the toppers dry and harden for a day or so before you pop them on top of the frosted cupcakes. 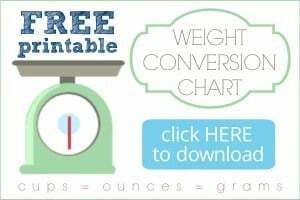 And be sure to scroll past the recipe card, for links to some of the tools I used for this cute Halloween project! More great Halloween ideas on my “Holiday” Pinterest board! Lightly dust your work surface with powdered sugar, and roll the fondant out to a thickness of about 1/8-inch. Use a 2 1/2-inch diameter cookie cutter to cut circles. Mark the fondant circles with a toothpick, as a guide for where the eyes and nose will go. Using a #3 piping tip, pipe 8 long hot pink teardrop shapes in royal icing around the eyes, in an asterisk shape. Using a #4 piping tip, fill in the centers with bright yellow royal icing. Pipe large yellow dots at the temples. Using a #1 piping tip, pipe an upside-down heart in black royal icing for the nose. Pipe the smile and teeth. Using a #1 piping tip, pipe a heart in aqua royal icing, at the center of the forehead. Pipe small aqua dots around the yellow elements at each temple. Pipe aqua scrolls on each cheek. Pipe a large black dot above the heart, and 2 smaller black dots below the heart. Pipe 2 black comma shapes on either side of the large black dot. Pipe 2 yellow dots above the black elements, and 3 yellow dots above each of the eyes. Allow the toppers to dry and harden overnight. Top the cupcakes with buttercream, then press on a fondant topper. Aw, thank you! I had a lot of fun creating the design. Thanks for reading and for the sweet comment! OMG, these are too cute to handle!! Love the detail and all the bright colors. Definitely a dessert that will stand out! Thank you so much Karly! I’m so happy you like these! Thank you so much Sarah! I had so much fun making them. So glad you like! Wow! The detail is incredible. What a beautiful set of cupcakes! What a beautiful work of ART. I love it! I’m so glad! Thank you so much MinShien! I love these! Tasty and beautiful! You did a great job of explaining how to do this! I am not always that skilled at decorating, but you make it sound so easy! And they are adorable! 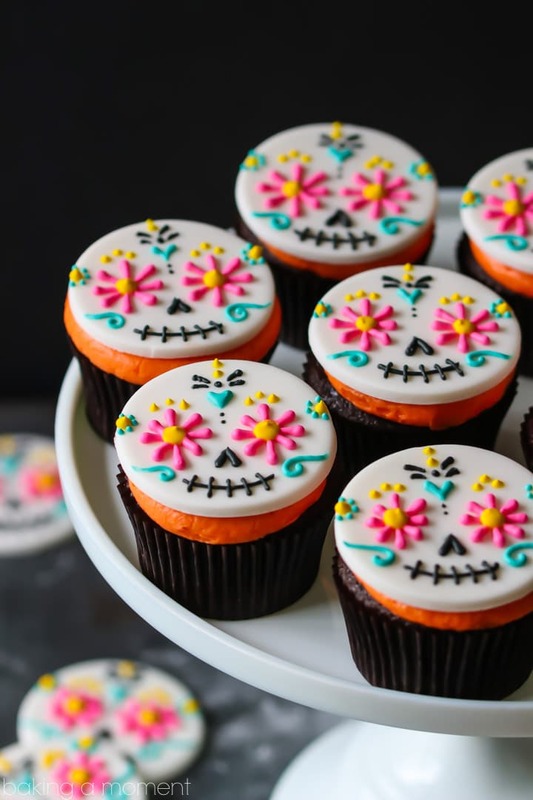 “Make these colorful Day of the Dead Cupcakes this Halloween!” Day of the Dead (Día de los Muertos) and Halloween are very different holidays.